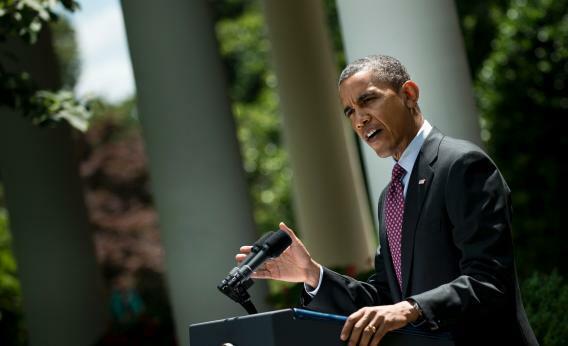 US President Barack Obama speaks during an event in the Rose Garden of the White House June 15, 2012 in Washington. Obama spoke about the Department of Homeland Security’s announcement to not remove young illegal immigrants based on their security risk and other criteria. President Barack Obama’s bombshell policy announcement Friday ending most deportations of the children of illegal immigrants represents the second time in as many months that his re-election campaign has used hot-button cultural issues to distract attention from the weak economy, while at the same time electrifying the Democratic base. The dexterity with which Obama and his team have been able to repeatedly put Republican nominee Mitt Romney in a box, forcing him to awkwardly cater to his party’s rigid, out of the mainstream views on gay rights and immigration rules, is helping to ease fears on the part of some Democrats that the economy would drag their man down in November. Many in the party had insisted Obama use his big address in Ohio Thursday to change messages on the economy, which has been plagued by slow job growth and a steep drop in household wealth. But the president didn’t do that, choosing instead to double-down on a populist framing of the 2012 election as a choice between a return to the explosion in wealth inequality of the Bush years and a chance for him to preserve the American dream. Perhaps inspired by Republican Governor Scott Walker’s approach to the Wisconsin recall election, the White House seems to have resolved on a strategy of maximizing turnout among core supporters, which for Obama means once again taking up the mantle of generational change that four years of gridlock, compromise, and inaction had sapped. “This is the way to remind them he’s still the same guy he’s always been,” Singer said. To be sure, no segment of the electorate will be as impacted by the president’s executive order as Latinos, the fastest-growing demographic group in America and especially potent in swing states like Florida, Nevada, Colorado, and Virginia. Obama won 67 percent of Hispanic voters in 2008, and while easing up on deportation – which had actually increased under his White House compared to the Bush administration – may not win him many Romney supporters, the move will help compensate for his failure to deliver on immigration reform, which he had promised Latinos would become law before the end of his first year as president. Segura’s colleague at Latino Decisions, University of Washington political scientist Matt Barreto, has already released new polling data showing 49 percent of Latinos are more enthusiastic about the president after his announcement. Likewise, Obama’s embrace of gay marriage last month after dancing around it for years brought in a flood of financial support and reinvigorated young voters who had been alienated by broken promises and bald political calculation. And the president’s immigration shift confirms he has no intention of getting drawn into a fight over the working class white voters of campaign lore, but instead changing the composition of the electorate like he did four years ago. Romney’s campaign seems to know this. Its strategy with regards to the Hispanic community, for one, has been to make it depressed or upset with the Obama administration – not to genuinely attempt to capture its support. The whiter the electorate, the better for Romney. But Democratic operatives argue that any exertion of presidential power like the immigration policy change is a plus, a reminder that Obama can deliver tangible goods and a way to connect with constituencies he’s let down since taking office in 2009. Political handicappers see Southwest states wth large Mexican-American populations like Nevada and Colorado, as well as Florida (with its large population of Cuban and Puerto Rican immigrants) as being the most impacted by Obama’s change in policy. But the Latino electorate is growing rapidly in Virginia, North Carolina, and Ohio as well. Whether Obama will again be able to use a high profile move on social issues to stir the pot between now and November is unclear. But he has already placed himself on considerably stronger footing going forward while presenting his opponent with a fresh challenge.